Ka-Zar is a character with a long, spotty history. He got his start all the way back in the pulp age, where he first appeared as “Ka-Zar the Great” in 1936. He was then one of several characters to make his first comic book appearance in Marvel Comics #1 (cover date October 1939)—part of a cast that included Carl Burgos’s Human Torch and Bill Everett’s Sub-Mariner. But the Ka-Zar we know today (the Kevin Plunder version) first appeared at the dawn of modern Marvel in the pages of X-Men #10 (March 1965). If you’ve never heard of him before, it’s understandable. Since that issue of X-Men, Ka-Zar has appeared in several different series under his own name, only to see each one of them cancelled. If you blinked you probably missed them. My own first full taste of Ka-Zar came in Ka-Zar the Savage #3 (cover date June 1981). This specific issue was brought to my attention by a friend who enjoyed it immensely because it appealed to his cornball sense of humor. Specifically, there was one bad, old joke and one fairly awful pun. The issue opens with Ka-Zar and his paramour, Shanna the She-Devil, in the city of Aerie Shalan, which is located on a huge mountain plateau high above Pangea, a region hidden deep within the Savage Land. Aerie Shalan is home to the Aerians, a humanoid race of beings with wings on their backs that allow them to fly. At one point, Ka-Zar is challenged to a friendly bout of fisticuffs by a brutish Aerian named Buth. It starts with Buth hitting Ka-Zar when he’s not looking. Sufficiently pissed, Ka-Zar proceeds to beat the crap out of Buth while sharing a joke about a parrot—the bad, old joke. Later, when Shanna asks him where he got the black eye, he tells her, “I got hit by a Buth”—the awful pun. Clearly, Buth was so named by the writer for the sole purpose of making this pun. That writer was one Bruce Jones. The preceding banter would not have been possible under previous writers, because before Jones came along, Ka-Zar still spoke mostly in “me Tarzan” lingo. But from the very first issue of Ka-Zar the Savage, Jones had him speaking articulate, even downright colloquial, American English. It was definitely a change for the better (although continuity nuts would drive themselves crazy trying to explain the sudden change in speech). Jones got his start on the Warren B&Ws (Creepy, Eerie) before moving into mainstream comics. Ka-Zar is probably his best work in this sphere. He would stay with the title from its launch in 1981 until 1983. A little more than half this run was beautifully penciled by Brent Anderson (who also helped plot a few issues), who was then followed by the more cartoonish Ron Frenz. Armando Gil did most of the finishes for both of them, which helped lend some consistency over the course of the bulk of the series. As painful as that joke and the pun were in the third issue, I still enjoyed it a great deal. So I went hunting for back issues and eventually caught up with the whole series. In addition to the humor, the romance and attendant melodrama were quite compelling. The series was a soap opera, but a great soap opera. 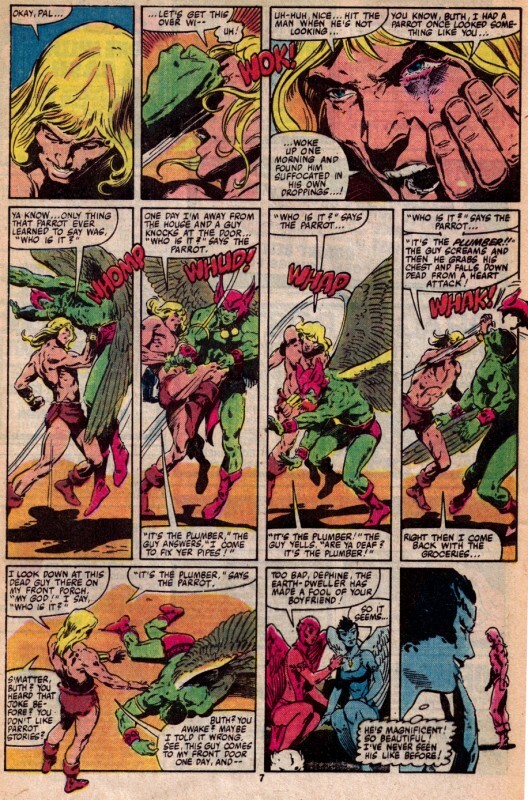 Ka-Zar and Shanna were volatile characters under Jones. Both were emotionally insecure, constantly uncertain of their own feelings, and very prone to jealousy. Their relationship was as unstable as it was passionate. In the very first issue of the series, we open with Ka-Zar and Shanna in the Savage Land discussing their relationship. Ka-Zar says he wants the two of them to “settle down” and that “maybe what we need is some sort of commitment.” Then he goes off to find Zabu, who’s missing, and what happens? He finds himself in Pangea (a Jones addition to the Savage Land), where he meets Leanne, Queen of Zarhan, and falls in love with her. Or he thinks he has. Maybe. He’s just not sure. Naturally, Shanna is none too pleased with this turn of events. Even after Leanne is (temporarily) written out of the series, she burns with jealously over Ka-Zar’s relationship with her. At one point, Shanna even marries someone else in a fit of pique! Ka-Zar also had some pretty cool adventures exploring the newly-discovered Pangea during this time, including one involving Dante’s Inferno. This storyline introduced Belasco to the Marvel Universe—the one-armed demon who would plague the X-Men in later years. Another personal favorite of mine was Ramona Cortland, a femme fatale character that was introduced in issue #18 (after they had wrung every last drop of tension they could from the Ka-Zar/Shanna/Leanne triangle the previous year and a half). What I loved about Ramona was that she was so deliciously evil, such a stereotypical soap-opera villainess, that you couldn’t help but be entertained by her. Her machinations eventually dragged Ka-Zar and Shanna out of the Savage Land all the way to New York City, where they ran into Kraven the Hunter, Spider-Man, and A.I.M. It’s a tremendously fun ride. I should add that Ka-Zar the Savage is also historically notable for the part it played in Marvel’s initial experiment in direct sales. 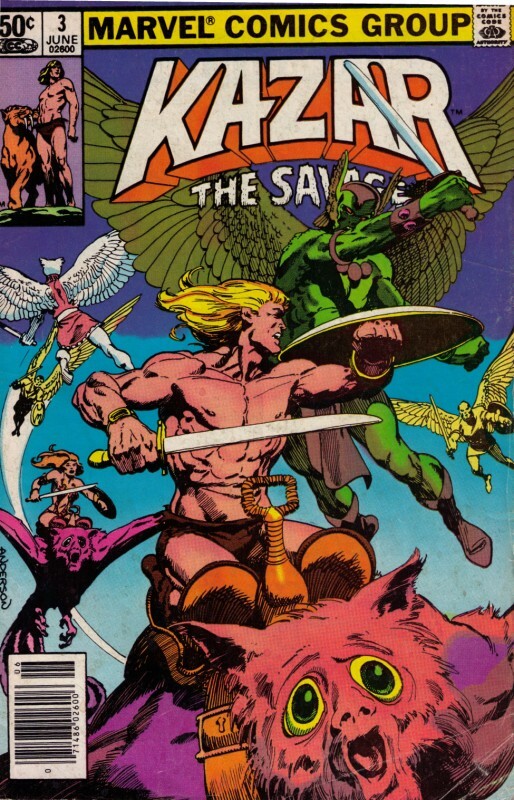 Starting with its tenth issue (cover date January 1982), Ka-Zar the Savage—along with the titles Moon Knight and Micronauts—dropped all advertising, raised its cover price to 75 cents, and only became available through direct-sale, comic specialty stores or via subscription. This extended the title’s lifespan another two years. Jones’s last issue as regular writer was #27, though he still got credit for the story idea for the following issue (#28). He left to write anthology books (Twisted Tales and Alien Worlds, among others) for Pacific Comics. (His work here, along with his earlier anthology stuff at Warren, seem to reflect a very deep appreciation for classic EC.) The Ka-Zar book only lasted six issues beyond Jones’s departure. Unfortunately, this run of Ka-Zar has never been collected in a trade paperback. (I swear to you folks, this is not planned on my part—it’s just a coincidence that so many of the arcs I cover here remain uncollected in trades. Or perhaps it’s a reflection of my very non-commercial tastes; I don’t know.) But you can probably find individual issues for less than a buck a pop either online or at a local back issue dealer, if you’re fortunate enough to have one near you.